The next generation in microdermabrasion, Hydrafacial, is a state of the art procedure to give your skin that rejuvenated sensation in 30 minutes. In the following steps you get the best skin of your life. A staggering 1.7 million people get a Hydrafacial treatment globally every year, making it only the second most popular aesthetic treatment after BOTOX. The growing popularity of the procedure has been attributed to its ability to produce effective results without any downtime, providing patients with a glowing skin within a short period of time. We proudly announce that Hydrafacial is now available at Marco’s derma care clinic for patients looking to obtain a fresher, glowing skin with the irritation of normal facials or surgeries. The procedure is provided by Canadian registered nurses, a certified medical aesthetic practitioner and a certified injector nurse, with over 17 years experience. It is a three-step non-invasive procedure that hydrates, exfoliates and rejuvenates the skin to provide benefits of several skin treatments in one simple treatment without any of the irritation and side effects. 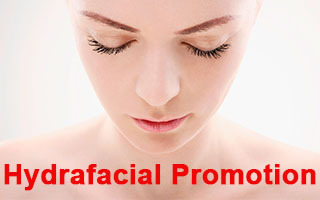 It combines an invigorating spa treatment with advanced medical technology to generate instant long lasting results. Using a multi-step process that includes the following steps, Hydrafacial is able to provide an entire skin care solution in about 30 minutes. Vortex Extraction: The revolutionary liquid vortex extracts any impurities and other unwanted structures from the skin. Vortex Cleaning: Hydrafacial treatment is administered using a revolutionary HydraPeel tip that uses the same vortex motion to treat the pores of the skin with a special solution. This step deeply cleanses the skin while softening it at the same time. LED Light Therapy: The skin is exposed to special kinds of light that encourage cell growth, giving the skin a layer that feels brighter is fresher than the last. Antioxidant Vortex Fusion: The vortex tip introduces the skin to a host of anti-oxidants that help in diminishing wrinkles and oiliness. Exfoliation: Finally the HydraPeel tip exfoliates the skin through multiple abrasive edges in order to get rid of any impurities or blackheads that might have been left out during the earlier parts of the process. Hydrafacial is an amazing innovation that allows patients to come out an examination room with a fresher skin that they went in with without the fear of any infections and side effects because the treatment makes use of non-surgical ways to cleanse and hydrate the skin. If you’re looking for that bright glowing look for a wedding, party or just because your skin looks dull as it is, feel free to contact us in order to set up an appointment for Hydrafacial. Our staff boasts an extensive amount of experience in the related field and you can rest assured that you’re is safe hands.